With our biggest schedule to date ahead of us, expectations where high leading up to our 2016 shark season at Guadalupe…….after spending over a month at sea we are happy to report that it has not disappointed……. With a fresh new crew full of optimism, experience and enthusiasm, preparations where excellent. This coming season sees 10 regular tourist trips, research expeditions and finishes off hosting discovery channel for a future shark week production. This is SDX’s 7th season running trips to Guadalupe and each year we are happy to report that it just keeps getting bigger and better! Throughout September we ran our first 4 tourist trips and what a start tot the season we have had! Trip number 1 got off to a flyer seeing up to 30+ sharks, amazing guests and beautiful weather conditions! The bar has been set high but the rest of September didn’t disappoint either…..Trips 2 – 4 continued in the same vain without a single rotation during our 3 day expeditions not seeing sharks! 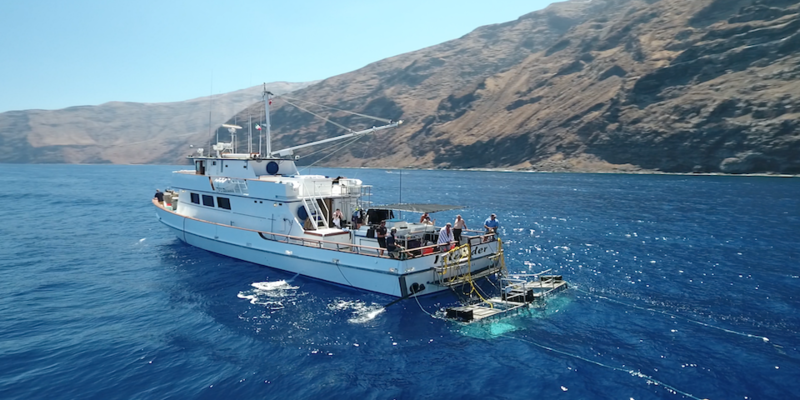 On top of this we had some incredible deep cage interactions and often had multiple sharks around the boat giving our guests maximum viewing opportunities. So far this year we have recorded higher shark numbers at this point than any other season. As well has identifying new animals we have also been visited by many of our old regulars. “Biteface” was spotted on trip 3 making this the 16th season he has been sighted here! Other old favourites that have returned include “Big”, “Geoff”, “Mau”, “Joker”, “Drogin”, “Meli”, “The Legend”, and “El Diablo”. There also seems to be a new era of sharks being sighted in the recent years and we are getting to know new regulars well now..these include “Luca”, “Milana”, “Monkey”, “Sad Face”, “Screaming Mimi” and “Islander” (named after our vessel). Last year was an El Nino year and we only reported seeing 2 big females (both in late November). With temperatures much lower this season we predicted that we would see the females arrive early this season however we where shocked and very excited to report that we have already had 2 of our favourite big girls……..On day 1 of trip number 4 a classic Guadalupe shark, “Tzitzimitl” made an appearance late in the afternoon. This shark is 18ft in length and is simply immense. We see her every 2 years so had predicted we would see her this year but never this early! She is the earliest our team have ever had one of these big females! Just when we thought it could not get any better, on day 2 we had another one! This time “Dotty” a 17ft female completely stole the show for our guests. Amazing. As October is now upon us we are looking forward to reporting plenty more sharks and as the water begins to cool even more we are hopeful we will be encountering more of the big females along the way……..one thing is for sure…..if the season continues like it has began, it could possibly be our best season ever! Stay tuned……..